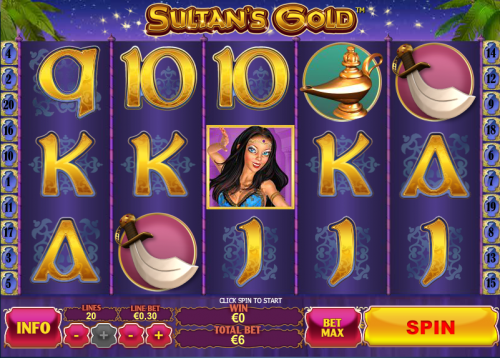 Sultan’s Gold is an Arabian-themed online slot machine from Playtech which transports the player to the fantasy world of the Arabian desert and features characters and items from that fabled era. It’s one of Playtech‘s simpler slots but that doesn’t detract from the total experience. Sultan’s Gold is loosely based on characters from Aladdin and so apart from Playtech’s standard playing card symbols we have before us Aladdin’s lamp, a short curved blade, Princess Jasmine and the Sultan himself. The wild symbol and the scatter symbol is the Sultan’s palace, a golden-domed, white-walled building with the starry night sky as it’s backdrop. The Sultan’s palace is the key to most things in this game; in standard gameplay it acts as the wild symbol and when it comes to the bonus game it acts as scatter. Three, four or five of these scatter symbols will trigger the bonus game and you’ll receive a generous 10 free spins with the bonus of a mystery scatter. The mystery scatter is picked at random at the start of the round and substitutes for any symbol except the Sultan’s palace. It now behaves as it would do in standard gameplay meaning you have a better chance of winning more free games within the bonus game. These can be won indefinitely. Sultan’s Palace errs towards the more basic of five reel slots; it only has the one special symbol and just the one bonus game. Really it will suit those who prefer the simpler slot machine rather than those who want all the bells and whistles.